THIS POST IS CURRENTLY UNDER CONSTRUCTION. PLEASE CHECK BACK LATER. One great way to bring depth and interest to a room is by adding color. I think it’s safe to say that a lot of us are afraid of decorating with color in our homes. We tend to play safe with neutrals, but that’s okay. The perfect way to add color in your home is to start with a neutral base and slowly infuse color as an accent. And the best part? It doesn’t have to cost a lot of money! Let’s go over five simple and inexpensive ideas to get your started. 1) Paint – This is probably the most obvious way to go about bringing color into a room. Painting your walls is actually relatively inexpensive, but if you really want to save money here’s a tip: paint an accent wall. Not only does painting an accent wall bring instant color into a room, but it also creates a great focal point without you having to spend a lot of money. 2. 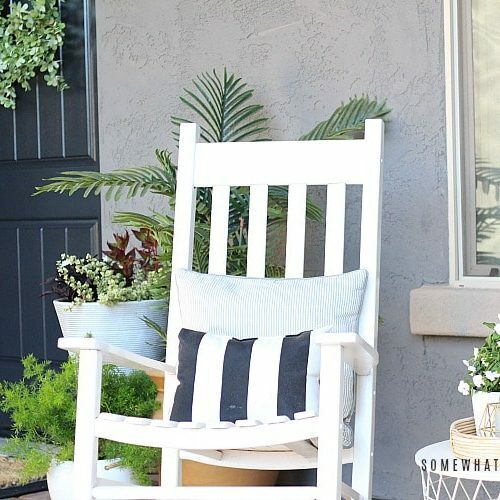 Paint Furniture: I sell and write about painted furniture for a living, so this is my favorite way to add color in the home. 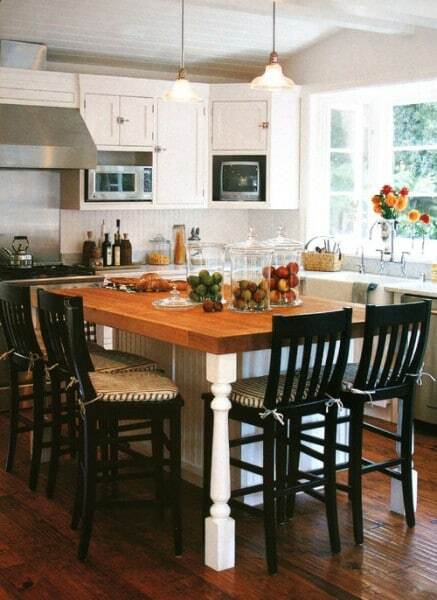 You can add a pop of color instantly, and without spending a lot of money to do so. 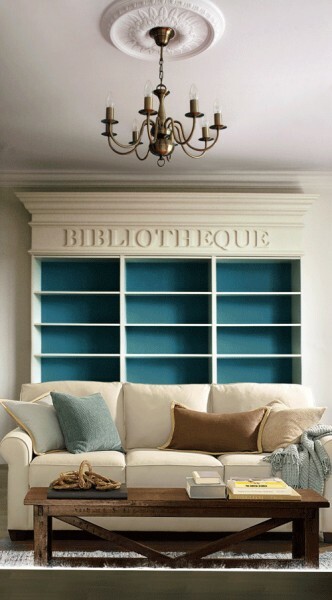 This is also a great idea for those who rent, because quite often painting walls is off limits. 3. 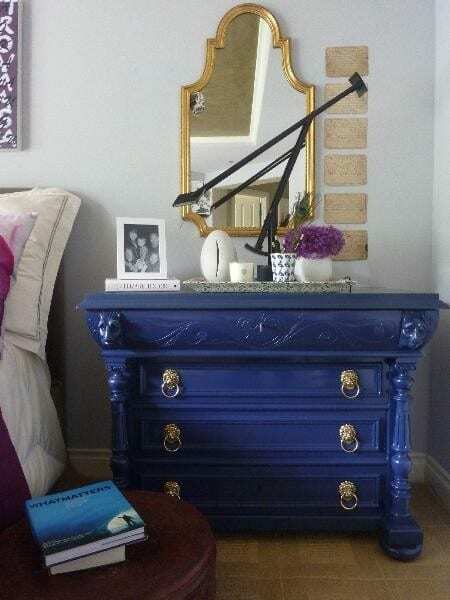 Paint the inside of furniture – If you don’t want to paint an entire piece of furniture, try painting part of it. For example, paint the back of neutral bookcase or hutch your accent color, and you will subtly bring that color into the room. 4. 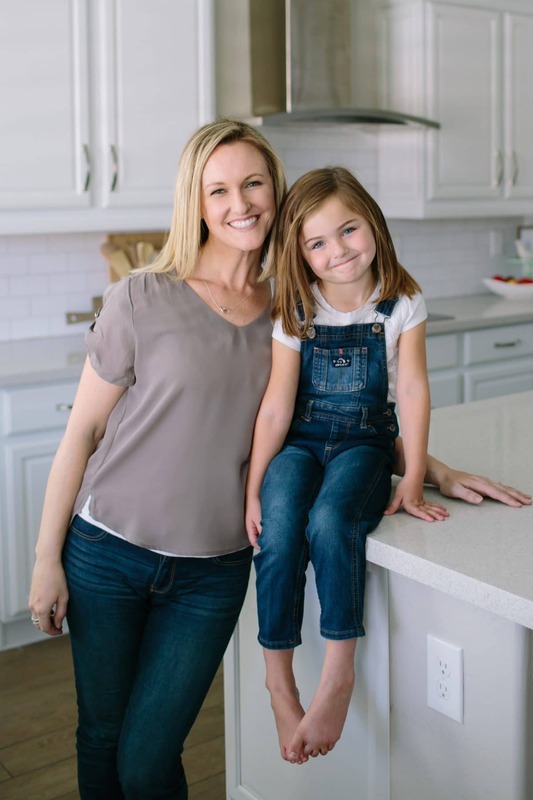 Bring in Natural Elements – One of my favorite things to do, especially in the dining room and kitchen, is to add color with natural elements. I love glass jars filled with spices like basil or parsley. Also, a glass jar filled with fruit makes a great centerpiece. 5. 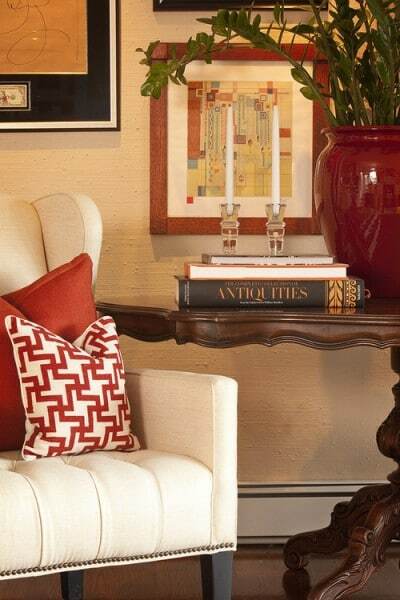 Accent Pieces – Finally, one of the simplest ways to bring color into a room is with accent pieces. 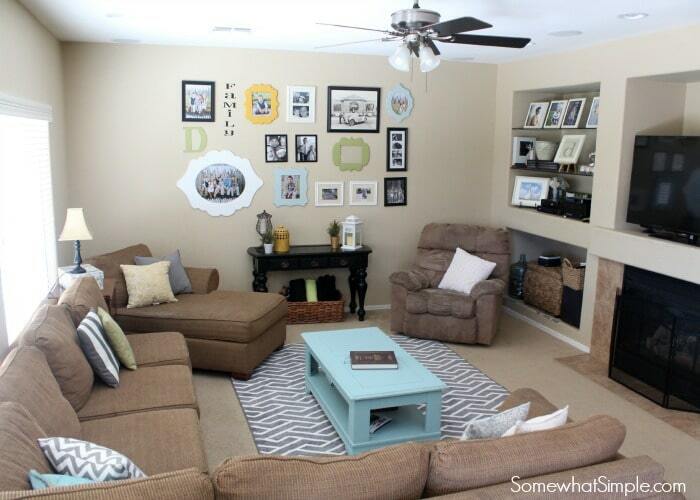 Add throw pillows, picture frames, vases, etc. in an accent color. This is easy and inexpensive. What are some of your ideas for bringing color into a room? I’ll be writing here on Somewhat Simple every month. Come join my Facebook community for more home decor and furniture painting tips! This is a sponsored post on behalf of Better Homes and Gardens products at Walmart. I LOVE color, but I have commitment issues. I go through phases where I love blue or green and then a few short months later I am on a yellow kick. Painting walls with the current trend or purchasing decor to match a color scheme gets expensive, not to mention how much time it can take. I learned years ago that for people like me, it is best to have neutral statement pieces and then change things up with non-permanent accessories. 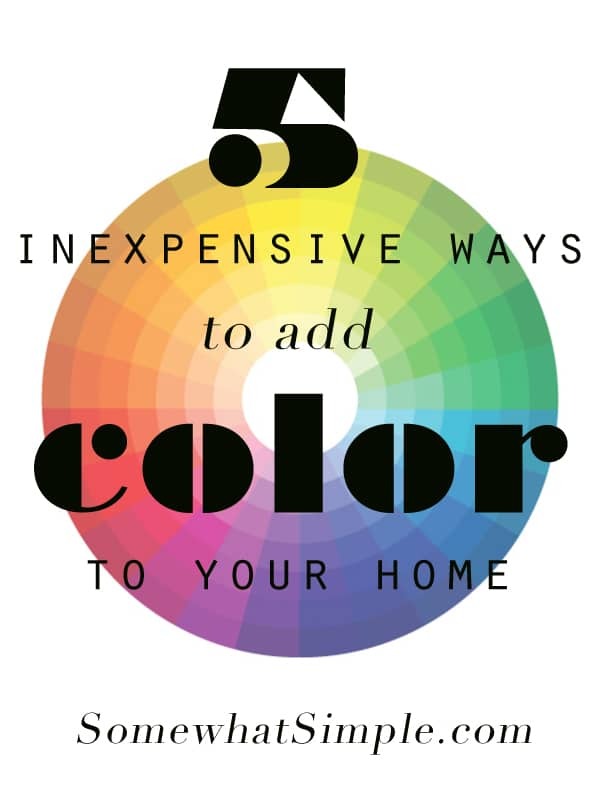 I’ll share my tips with you for 5 Easy Ways to Add Color to a Room without breaking the bank. Brown, brown and more brown! 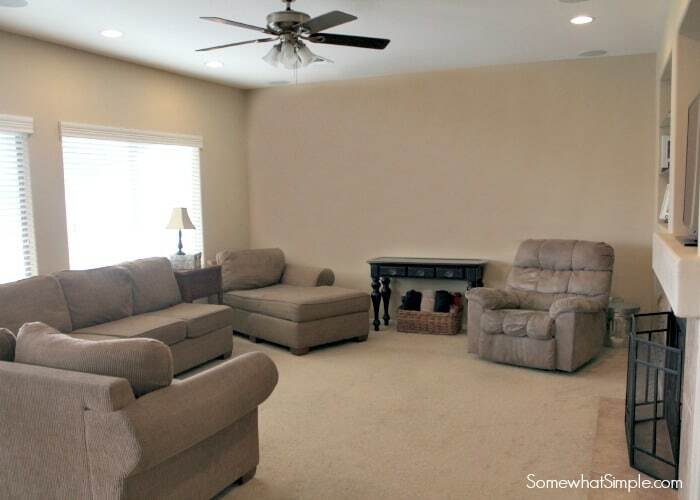 The couches, the walls, the carpet…. it is all blah. But that’s ok, because I have a clean canvas to work with! 1. Add pictures to your walls. I’ve had this collage for quite some time and I am actually ready for a change, but one thing is certain- a big wall needs a focal point and it provides a great opportunity to add some color. 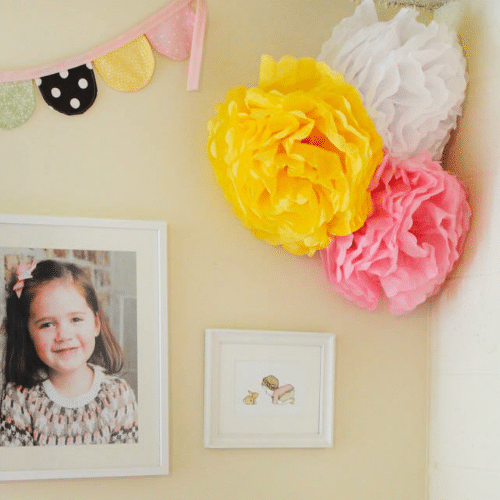 Colorful frames and/or colorful pictures are an easy, affordable way to achieve this. 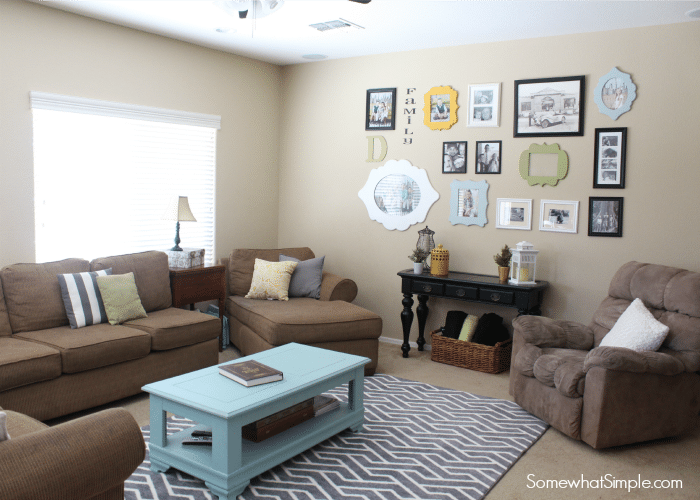 Even a gray and white rug adds such a fun pop of color and texture and dimension! I don’t like a lot of clutter, and there is a fine line between decorative accents and clutter. But grab a few colorful focal points and make a simple vignette. With nick-knacks, my general rule of thumb is “less is more”. I wish I had a before picture of this coffee table. It was brown, nothing special. My sister in law came to visit one weekend and she said, “You should paint your coffee table.” And my neutral-loving self said “White?” and she said “Blue.” It quickly became one of my favorite pieces of furniture. I’ve tried it in a couple different rooms in my house. I love it in my living room, but it is currently in my family room ’cause it fits nicely there too! Point of this rant is- don’t be afraid of the power of paint. This post is in support of BHG at Walmart. 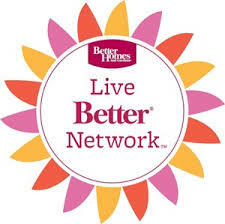 I am part of the BHG Live Better Blogger Network. Thank you for supporting our sponsors so we can continue to provide creative content on Somewhat Simple. 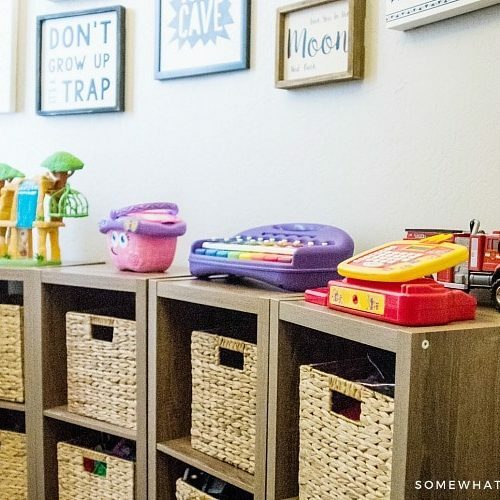 Playroom Under the Stairs – The Perfect Place to Play! 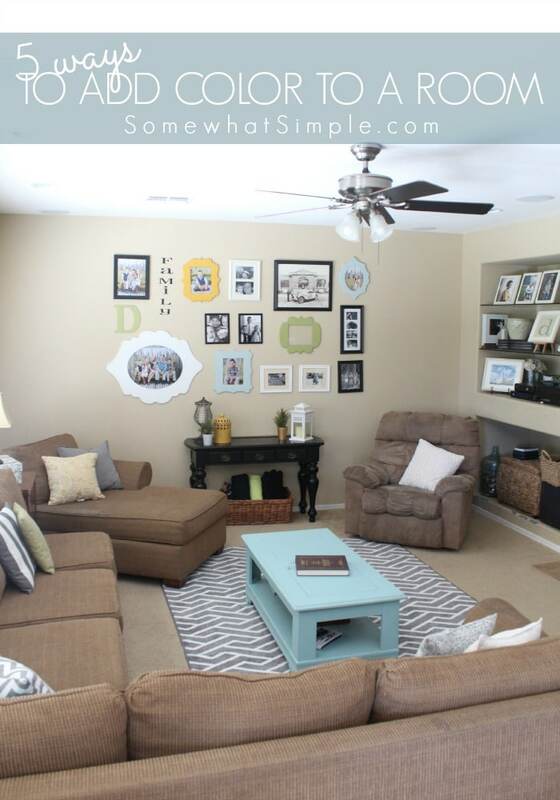 always looking for ways to make a room “pop”, like your ideas and pictures without breaking the bank. Thanks for sharing.